It is amazing how a simple thing as blogging and sharing your recipes can change your life. A major difference between cookbook authors and food bloggers is that while the former are not readily approachable for any clarification, a food blogger is always just an email away. Their casual and more homely approach, filled with experiences makes it easier for all of us to write to such a person, which in most cases culminates in strong friendships. I have found that! This is what makes blogging such a pleasure. I may be busy at times but I know I will always get back to this medium and always connect with my readers, however far off or few they may be! This journey has been enriching for me in more than one way. When I started off I was a vegetarian, weighing more than my body constitution permitted, unaware of many healthy techniques of cooking, unaware of food allergies and mis-informed about a healthy diet. Now, almost three years later I have changed, not only food-wise but also in my view of life and people. I know I say this often but I really can’t help it! I am so thankful for those changes! Within two months of blogging, I realized that my cuisine was very limited. I have always been experimental but never ventured beyond a basic alfredo sauce or making chilly paneer or manchurian at home. I would be surprised when I read blogs that mentioned ‘lactose intolerant’, because such a condition is virtually non-existent in my Country. Now I realize that we just ignore and abuse our body, no matter what! Basically mankind itself is lactose intolerant and we have forced ourselves on a diet that has more protein than that needed by our bodies, leading to a body that allows cancer cells to thrive. Please be aware that once consumed, milk and other animal based products act the same way as meat or fish. I have had friends who never smoked, drank or ate non-veg and yet they had cancer, some unfortunately lost the battle and passed away. I learnt that people can also be gluten intolerant and that led me to read more about what the term meant and why it is that few people suffer from such conditions. Strangely, I found that my body too reacted more positively when I tried living gluten free. I hardly ever suffered from cramps, indigestion and gas when I avoided wheat based products. Simply put, I don’t think I have ever approached food more scientifically than now! And nutrition as a subject makes more sense now than before. 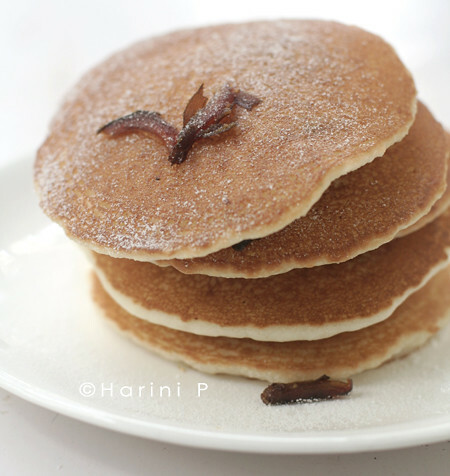 Coming to today’s recipe, I began making pancakes the traditional way, with refined flour or a mix of both whole wheat flour and refined flour. Then one day, a couple of months ago I tried making it with rice flour since in India, making pancakes with rice and yeast/coconut water/tender toddy fruit water is pretty common. Without making too many adjustments to the recipe I found that the gluten free version was equally tasty, in fact better than the pancakes made with wheat flour. To repeat what Jr.H said, “It is tastier because it has a soft and yet grainy texture when eaten. Whole wheat flour seems to slip even before one can fully savour it.” The vegan, gluten free version has come to stay! I will give both the version so you can choose what suits you best. The healthy whole wheat version and the healthier gluten free, brown rice version. There is obviously a difference in texture as the whole wheat version is more cohesive than the gluten free version which is more delicate and breaks into a grainy powder unless eaten carefully. Now, I make the gluten free version more often because it is tastier than the whole wheat or white flour version! Honest, it is! Was too hungry to take pictures! Almond powder (ground with skin) – 4 Nos. Raw cane sugar – 1 tbsp. Baking powder – 1 tsp. or 4g. Sour cream (I used Rich brand soy cream that turned sour) – 1.5 tbsp. Oil (Any neutral oil such as coconut oil or sunflower oil) – 1 tbsp. or 14g. Any vinegar or lime or mirin (I find mirin, a Japanese rice sake the best as it is milder) – 1tsp. Whisk the dry ingredients in a mixer or by hand to mix the ingredients well and to aerate. Empty into a mixing bowl. Whisk the wet ingredients in a blender. Make a well in the center of the dry ingredients and pour the wet ingredients. Mix well but do not beat. You should have a lumpy batter. If the batter is dry add milk in tablespoons and mix till you reach a batter of the consistency of the batter used for thick pakodas or idlis. Heat a pan and grease the surface lightly. Turn heat to low and using a small ladle (or a cup used for 1/4 cup measure) pour the batter in the center of the pan. It will spread a little on its own. If not, flatten it lightly with the back of the ladle to about 3 or 4 inches as per your need. Dot with a quarter teaspoon of oil on the circumference of the pancake. Within a few seconds you will notice bubbles forming on the surface and the batter will turn translucent as it cooks. Using a pancake turner lift the edge slightly to see whether the underside is golden. Since I have used raw cane sugar the brown can be deceptive as the batter itself is brown in colour. I just let it become dark and crisp at the edges to make sure that it is cooked. If so, flip the pancake over and cook on the other side till done. Similarly prepare the rest of the pancakes. You may drizzle date syrup or maple syrup or just dust with icing sugar. I top with any fruit sauce as well or just dust sugar on top. Edible gum (I use dink which is available locally. Can be replaced with xantham or guar gum in the same quantity) – 1/4 tsp. Sour cream (I used Rich brand soy cream that turned sour) – 1 tbsp. 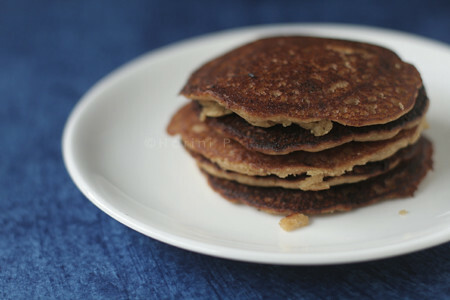 Follow the same method as for whole wheat pancakes. Only this one takes slightly longer to cook. Almost a minute on one side in low heat. I keep the heat low because the cane sugar seems to caramalize fast. Add the following ingredients separately as an option for a different pancake each time. Dates – Slivered thin or chopped into pieces – 1 soft Muscat variety towards the end. At the end of whisking the batter fold in 1/2 cup of blueberries for blueberry pancake, 1/2 a cooking apple chopped into very small cubes for apple pancakes or any other fruit of your choice. Adjust the milk as needed. Depending on the quality of flour milk needed may vary by a small amount. If your first pancake breaks as you flip, remember to cook further the next time. Also, it would be a good idea to keep the size of the pancake small enough to be easily flipped with your turner. If your pancake turner has a broad base you can flip a 5 inch pancake without breaking it more easily than with a small one. You could make it healthier by eliminating the sour cream and adding more milk instead but the fluffiness may reduce. I have noticed these days that most of the time our generation seems to eat food to fill a psychological need more than for hunger. It is probably because the farming is no longer organic and the vegetables are not naturally fortified with as much minerals and vitamins as they were a few decades ago. Dr.Nandita Shah, in her peas vs. pills workshop sheds light on the subject. She explains the need and addiction to food. I won’t say we have overcome it because years of spoiling our food habits are not so easily given up but I am trying. My daughter and I are on day 7 of our raw vegan trial and we are full despite eating salads and fruits. Yet a couple of days ago when my flick friend, Kalyani visited, we could not resist the gluten free bread I tried from Aran’s recipe. We had a quarter of a slice each. I had also made upma kozhakottai and we had half each of one kozhakottai! However since the last two days we have returned to our raw vegan diet. What’s with the raw vegan thing? I started the raw vegan diet because Jr.H is suffering since the last few years from a severe burst of boils on her face. We had visited two dermats but the boils would subside as long as the medication lasted and would surface within a few days thereafter. She is presently taking homeopathic treatment since three months and the condition remains the same. I suspect that it is probably some food item she may be allergic to, so we decided to put her on a raw vegan diet for a detox and then introduce different items one by one keeping a record of our observations. By day 4 of the raw vegan diet, her skin showed fifty percent improvement as the boils had all disappeared leaving a few spots and no fresh ones have erupted. By day 5 I had lost two kgs., become more energetic and felt that my breath was much fresher and I am not sweaty as I was. Even if I do, there is no body odour. These are the changes I observed for myself. Mm this looks healthy and delicious. I've found that I like experimenting with different grains even though I process wheat just fine. They add great flavor and texture and in the case of pancakes and other batters that're easy to overmix, the lack of gluten is a plus. Bin, thanks! Will share the diet soon. u like some of the other bloggers are blessed with multitalents…..u cook,u blog,good photography and wallah a very good writer….m surely impressed…. 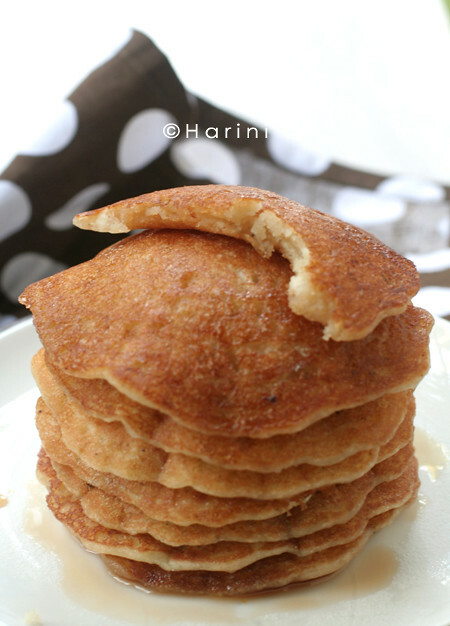 lovely pancake recipe.Its healthy and tasty at the same time.Will surely try it. Looks very tempting! vegan pancakes are definitely eye catching. Thank you everyone. I will keep you posted on my progress with the raw vegan diet. Priyanka, Happy Navratri to you too! 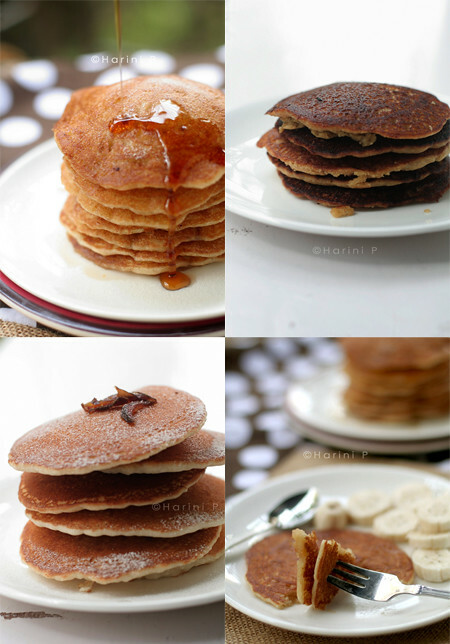 Beautiful looking pancakes, looks super delicious and yummy! I liked the rice pancakes and especially because you added raw cane sugar in it. Great results of your special raw food diet … will be waiting for your series. You are right about cooking a recipe from a blog vs from a cook book. think I have tried lot more recipes from blogs than from a cookbook.